OK so I admit it. I am a Lito Sheppard fan. Yes the man needs to shut his trap and quit whining about being underpaid. Yes the man needs to stay healthy for a full season. Yes the man made a stupid PR move by hiring Drew Rosenhaus as his agent. 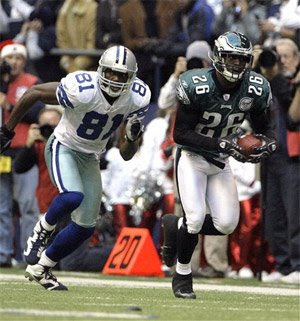 But, come on, if we are strictly talking football, how could any Eagles fan not love #26. He is a true playmaker on defense. He is a shut-down corner. Why do you think that the Eagles have had great success against Dallas lately? Answer, because we have Lito to shut down Terrell Owens. Look at the game film, Lito was the difference in last year's 10-6 victory over Dallas. Is it a coincidence that the years Lito stays healthy the Eagles make the playoffs? When Lito is not healthy the Eagles are home for the playoffs. Look at the stats, when Lito plays in a last 12 regular season games the Eagles make the playoffs every year. Sheppard is a two time Pro Bowler. Sheppard has 3 interceptions returned for touchdowns (two being over 100 yards). It is a joke that Sheppard is not guaranteed a starting position. Listing Sheppard as a dual starter is an insult. Hearing Lurie throw out YPA numbers is ridiculous and makes Lurie look like a buffoon. I love the Asante Samuel signing. With Lito's injury history the Eagles needed an insurance policy and why not get the best insurance on the market. But is Samuel really that much better than Sheppard? Why does Samuel grab all of the national attention when top cornerbacks are discussed? Why does Sheppard get shafted? Samuel had unbelievable seasons in 2006 and 2007. Samuel had 16 interceptions in those two seasons. Samuel made his first Pro Bowl in 2007. But when you compare the career numbers and accomplishments, Sheppard is right there (if not ahead) with Samuel. One also has to wonder if Samuel's numbers are the result of the Patriots success. We have to be at least a bit curious to see if Samuel can succeed with the Eagles. No worries with Sheppard as we already know how he plays in JJ's defense. I am not arguing that Samuel wasn't a good signing or isn't a stud player. I just wanted to remind everyone what a top talent Sheppard is. All of the off-season bickering (though Sheppard's own fault) has overshadowed what Sheppard brings to the field. Even though it's only preseason it's nice to see Sheppard right where he belongs tonight. In the starting lineup. i dont care who does it, the Eagles need turnovers this year. if it is Sheppard, good. if it is samuel, good. if it is brown, good.